I first read this book a year ago and loved it. Now that I’m thinking about moderating a Five College Learning in Retirement seminar on botany, I read it again, and like it even more. Chamovitz has a conversational writing style and a good sense of humor. It’s a fascinating little book on how plants respond to their environment. It’s organized around some of the same categories of physical stimuli to which people and animals respond: light, sound, smell, physical touch, and gravity. The book is based on experimental research. 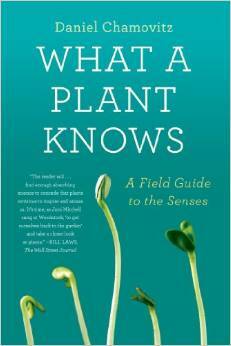 Chamovitz explains clearly in the very beginning that this book is not an attempt to claim that plants have feelings. We all know that most plants will turn toward sunlight. But many plants also respond to changing day lengths, grow taller when they don’t have enough light, and respond differently to different colors of light, something I didn’t know. What part of the plant responds to light and how? How do plants respond to sounds? Or don’t they? How do plants know up from down? Can you trick plants into thinking some other direction is down? What happens if you grow plants where there is no gravity like in space? Part of the answer is that the cells in the middle of the root tip contain dense ball-like structures called statoliths that are heavy and fall to the bottom of the cell. If high-tech tools are used to force the statoliths to one side rather than the bottom, the roots of the plant will start to bend in that direction. We’re all acquainted with the sensitive plant that closes its leaves at a touch, and we’ve seen Venus fly traps that sense the touch of an insect. But there are other ways in which plants respond to touch. If you cut the apical bud on a plant, the buds below the lost apical bud grow. How does this happen? Did you know that plants can respond to damaged leaves by changing the chemical properties of as yet undamaged leaves? Why does dodder—that parasitic nuisance—grow toward a tomato plant rather than a wheat plant? Can it smell the tomato plant? All these questions and many more are answered by Chamovitz. It’s good winter reading after the holidays.